Nanoscale one-dimensional nanostructures (i.e. nanowires) offer vast opportunities in photovoltaics and photonics due to their exceptional optical and electrical properties, which are entirely tunable by varying their architectures. Unfortunately, current synthetic limitations have hindered the range of studies and devices that can be made with such structures. In a recent manuscript, published online as a letter in Nature Nanotechnology, Northwestern University researchers have found a way to engineer surfaces along multiple directions in a nanowire. This new technique, termed coaxial lithography (COAL), offers a combination of radial and longitudinal degrees of compositional freedom within the nanowire. Synthetic control over the radial dimension combined with the possibility of selectively deleting features used to build the nanowires significantly expands the range of architectures that can be synthesized using COAL. Professor Chad A. Mirkin, the corresponding author of the paper, said, "COAL allows for the rational design and preparation of nanowires with very complex architectures that cannot be made by any other techniques." 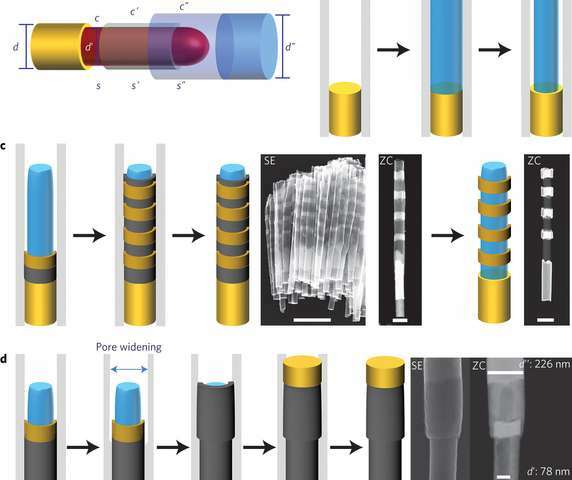 Mirkin's Ph.D. student Tuncay Ozel and postdoctoral researcher Gilles Bourret, equal contributors to the paper, said, "Using our approach, an almost unlimited number of shells can be prepared on the same nanowire. Complete tunability in terms of surface plasmon resonance and electric field by controlling the diameter, length and ring spacing is reported with an unprecedented sub-10 nanometer precision. Both the nanowire and plasmonics communities will find these advances substantial." Mirkin added, "I believe that COAL will dramatically increase the capabilities of researchers who are interested in studying the chemistry and physics of negative surface materials, interfaces between organic and inorganic materials, and light-matter interactions. This technique allows for the synthesis of materials with architectures unachievable via other means." Remember I previously described a way of getting even higher resolution by crisscrossing the wires in layers, and by staggering them in sheets so the voids between wires are filled a few nanometers back, but far enough to prevent arcing and whiskering from happening. With this we are armed with the tools to study both the very large and the very small in a way never seen before, just as I expected from the earliest studies of nanowires and nanotubes. If you don't understand what I mean, put your fingers open on one hand and place the other hand behind, but off-set bya finger-width. OFFSET BY ONE, BUT BEHIND ONE ANOTHER, LOOKS LIKE THIS FROM THE FRONT. Now you have 5 nm resolution using 10 nm detectors. @ Returnering-Skippy. How you are Cher? We are all real good down here in Port Fourchon. In Lafourche Parish I mean. Thanks for asking. I ain't going to put my fingers there non. Looks like that from the side too Cher. Non podna, now you have your self looking silly and everybody standing around asking what that couyon is doing with his fingers and making faces (with the silly looking pointy cap sitting on the side of his head.) Other than that it was the really good experiment.